Eurocom shows us why its latest ultra-thin gaming notebook may be the better choice over the MacBook Pro. The recently released 15.6-inch Eurocom Q5 is equipped with the same i7-7700HQ CPU and Max-Q class GPU as some of the latest gaming notebooks like the MSI GS63VR 7RG, Asus Zephyrus, Alienware 15, and HP Omen 15. Despite sharing a wide range of similarities with these systems, Eurocom is instead directly targeting potential MacBook Pro 15 buyers with marketing material highlighting the advantages of the Q5 over Apple's popular laptop. While we can't argue with the performance and gaming benefits of the Q5 over the MacBook Pro 15, it's still a rather puzzling comparison considering that the two systems are arguably of different categories. Eurocom's banner ads reveal the Q5 to be less expensive than the Apple alternative and with faster hardware. It's vague in details not unlike most advertisements, so we've expanded on some key attributes through the table below to show more differences between the systems. In short, the MacBook is thinner, lighter, and tougher-built with a significantly brighter display, longer battery life, more accurate colors, and deeper contrast. In turn, the Q5 is a gaming machine first and foremost with significantly faster graphics performance, wider variety of ports, and easy serviceability and customization. Future Q5 SKUs will implement Sharp IGZO panels not unlike those found on the XPS 15 or Razer Blade series to narrow that color and contrast gap between the Eurocom and MacBook Pro. It's worth mentioning again that these are two very different notebooks and the comparison is borderline apples and oranges. Nonetheless, our quick breakdown should aid those who may be on the fence. 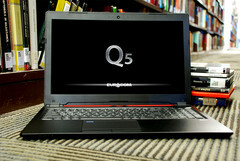 See our full reviews on the Eurocom Q5 and Apple MacBook Pro 15 for more information on each of these notebooks.